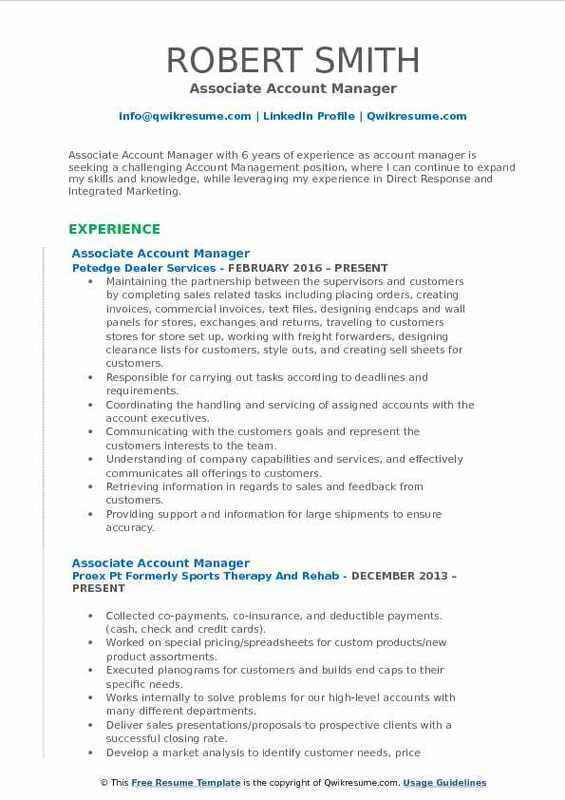 Associate Account Manager’s job description comprises of a variety of tasks that may include maintaining client relationship, managing organizational expenses, ensuring smooth workflow or handling accounts of multiple clients. 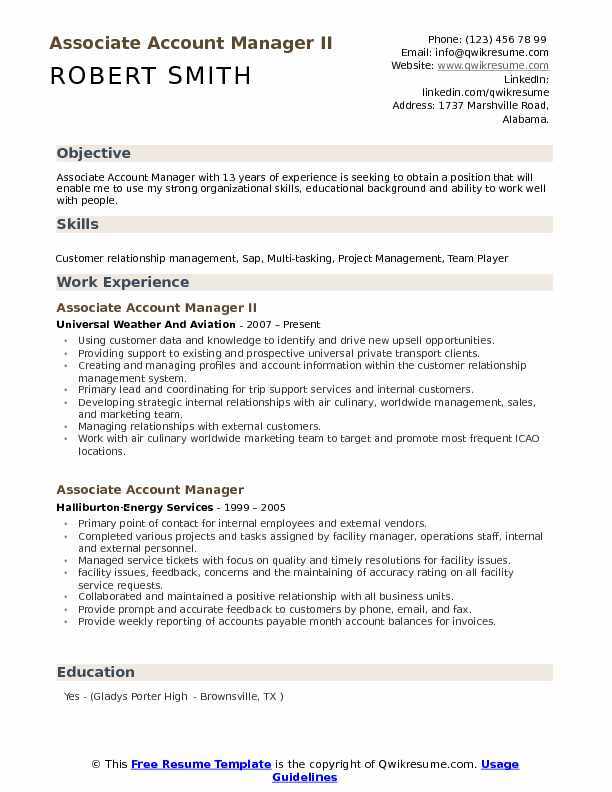 The job duties incorporated in a refined Associate Account Manager resume include – handling client account, updating clients, ensuring clients work are carried out on time, reporting to the account manager regarding the progress of client accounting file, updating renewals, handling new accounts, taking responsibility for any discrepancies in a client account. The other job duties are verifying and compiling financial data, reviewing financial reports, monitoring payments and maintaining inventory records. To be a successful Associate Account Manager, some of the following skill sets are considered essential – solid experience of CRM software, MS Office and a demonstrable ability to communicate. A degree with proven work experience in a similar profile is sufficient to get into an entry level, while an additional certification with knowledge of accounting or project management is indispensable to progress. Summary : Associate Account Manager with 13 years of experience is seeking to obtain a position that will enable me to use my strong organizational skills, educational background and ability to work well with people. Using customer data and knowledge to identify and drive new upsell opportunities. Providing support to existing and prospective universal private transport clients. Creating and managing profiles and account information within the customer relationship management system. Primary lead and coordinating for trip support services and internal customers. Developing strategic internal relationships with air culinary, worldwide management, sales, and marketing team. Managing relationships with external customers. Work with air culinary worldwide marketing team to target and promote most frequent ICAO locations. Maintaining and updating leads, opportunities, account information, account strategy in department boomerang, salesforce, and CRM systems. Introducing transportation services offerings and create customizable profiles on new and managed clients accounts. Performing fuel operations task as required by internal and external customers. 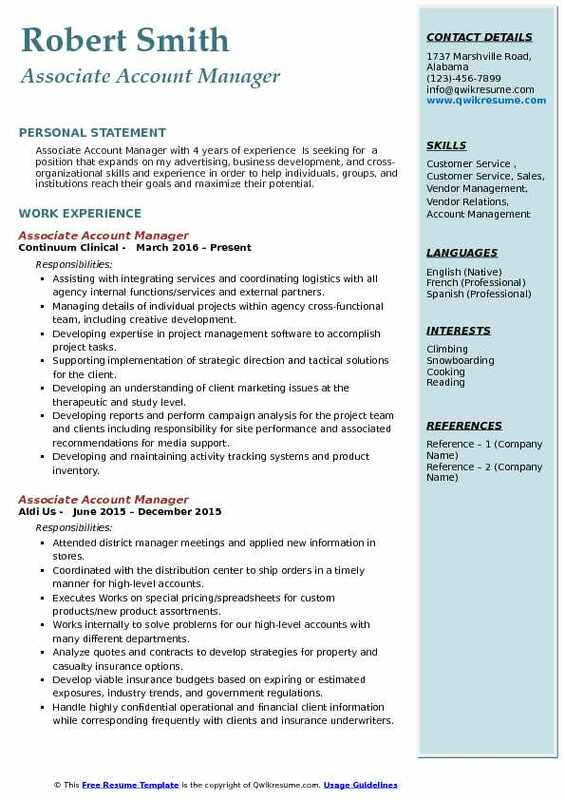 Summary : Associate Account Manager with 17 years of experience is seeking to work with a progressive company that offers challenge and opportunities for advancement in my career and knowledge. That will utilize the skills I have attained and adding fruitful educational experience that can late be applied while serving the company. Identifying and converting leads into opportunities within your assigned accounts. Retaining all profiles and account information within the customer relationship management system. Acting as primary contact and subject matter expert for trip support services and internal customers. Identifying opportunities for process or procedural improvement to internal/external customers. Managing relationships with external customers including but not limited to transportation companies, ground handlers, and hotels. Accountable for developing an in-depth knowledge of our product and series offerings. Perform fuel operations task as required by internal and external customers. Providing primary operational support to existing and prospective uwa customers. 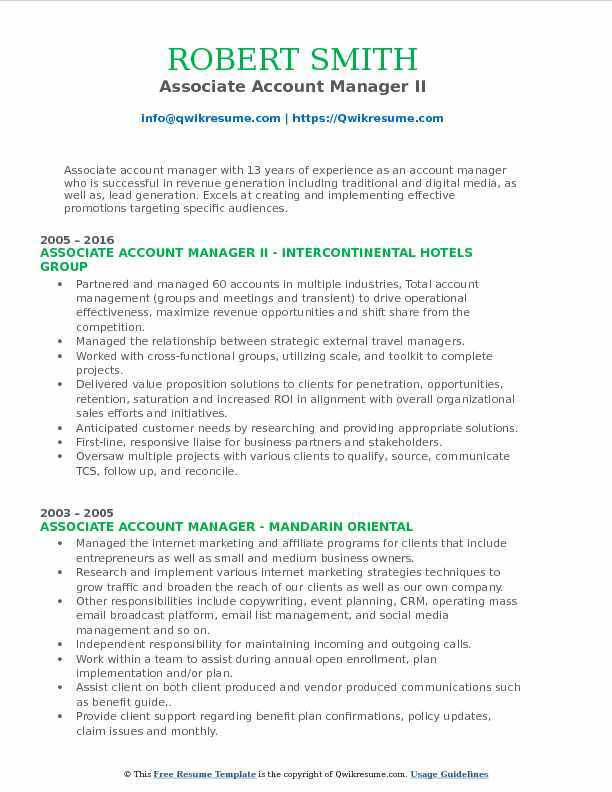 Headline : Associate Marketing Manager (Sales Program Leader) with 6 years of experience is seeking a challenging Account Management position, where I can continue to expand my skills and knowledge while leveraging my experience in Direct Response and Integrated Marketing. experienced partner with a focus on accelerating revenue growth. Skills : Sales, Strategy, Microsoft Excel, Microsoft Office, Microsoft Access, Product Development, Visual Merchandising, Demand Planning, Pricing Negotiation, New Item Development, New Item Launches. 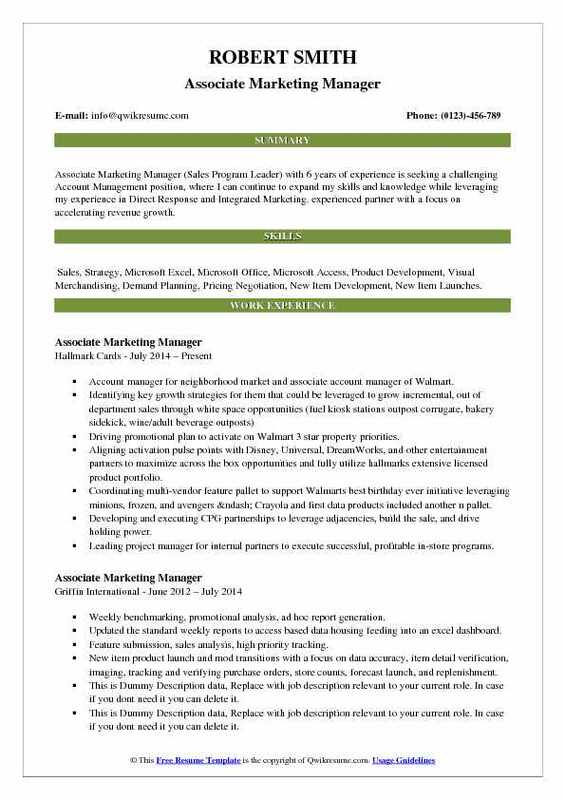 Account manager for neighborhood market and associate account manager of Walmart. Driving promotional plan to activate on Walmart 3 star property priorities. Aligning activation pulse points with Disney, Universal, DreamWorks, and other entertainment partners to maximize across the box opportunities and fully utilize hallmarks extensive licensed product portfolio. Coordinating multi-vendor feature pallet to support Walmart's best birthday ever initiative leveraging minions, frozen, and avengers – Crayola and first data products included another n pallet. Developing and executing CPG partnerships to leverage adjacencies, build the sale, and drive holding power. Leading project manager for internal partners to execute successful, profitable in-store programs. 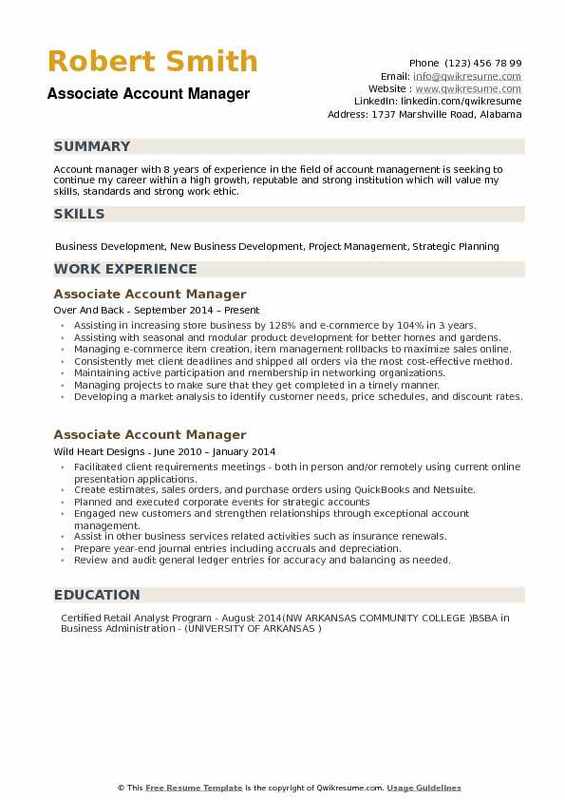 Headline : Associate Account Manager with 6 years of experience as account manager is seeking a challenging Account Management position, where I can continue to expand my skills and knowledge, while leveraging my experience in Direct Response and Integrated Marketing. Maintaining the partnership between the supervisors and customers by completing sales related tasks including placing orders, creating invoices, commercial invoices, text files, designing endcaps and wall panels for stores, exchanges and returns, traveling to customers stores for store set up, working with freight forwarders, designing clearance lists for customers, style outs, and creating sell sheets for customers. Responsible for carrying out tasks according to deadlines and requirements. Coordinating the handling and servicing of assigned accounts with the account executives. Communicating with the customer's goals and represent the customer's interests to the team. Understanding of company capabilities and services, and effectively communicates all offerings to customers. Retrieving information in regards to sales and feedback from customers. Providing support and information for large shipments to ensure accuracy. 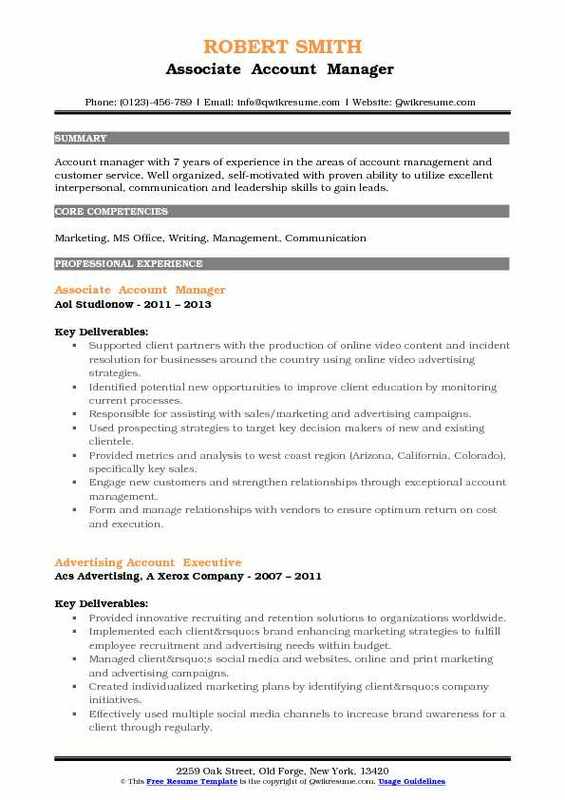 Objective : Associate Account Manager with 4 years of experience Is seeking for a position that expands on my advertising, business development, and cross-organizational skills and experience in order to help individuals, groups, and institutions reach their goals and maximize their potential. Assisting with integrating services and coordinating logistics with all agency internal functions/services and external partners. Managing details of individual projects within agency cross-functional team, including creative development. Developing expertise in project management software to accomplish project tasks. Supporting implementation of strategic direction and tactical solutions for the client. Developing an understanding of client marketing issues at the therapeutic and study level. Developing reports and perform campaign analysis for the project team and clients including responsibility for site performance and associated recommendations for media support. Developing and maintaining activity tracking systems and product inventory. Leading the ideation, development, and distribution of motivation campaigns. Establishing ongoing communications and relationships with site personnel. Headline : Associate Account Manager with 6 years of experience is Actively searching for a new opportunity in business development, which will allow me to contribute to the overall success of company objectives, whilst continuing to develop my professional competencies. Managing the largest east coast client which encompassed commercial and medicare-d lines of business and over 700,000 individuals. Delegating tasks to account team members and worked with cross-functional departments to make sure processes were being followed accurately and efficiently. Implementing new plans and plan changes that include: max out of pocket, deductibles, co-pay structure and clinical program changes. Preparing and distributing month and quarterly reports. Develop a market analysis to identify customer needs, price schedules, and discount rates. Summary : Associate account manager with 13 years of experience as an account manager who is successful in revenue generation including traditional and digital media, as well as, lead generation. Excels at creating and implementing effective promotions targeting specific audiences. Partnered and managed 60 accounts in multiple industries, Total account management (groups and meetings and transient) to drive operational effectiveness, maximize revenue opportunities and shift share from the competition. Managed the relationship between strategic external travel managers. Worked with cross-functional groups, utilizing scale, and toolkit to complete projects. Delivered value proposition solutions to clients for penetration, opportunities, retention, saturation and increased ROI in alignment with overall organizational sales efforts and initiatives. Anticipated customer needs by researching and providing appropriate solutions. First-line, responsive liaise for business partners and stakeholders. Oversaw multiple projects with various clients to qualify, source, communicate TCS, follow up, and reconcile. Diagnosed time saving/payroll solution for running reports and entering negotiations to get back about 20-30 hours a year. 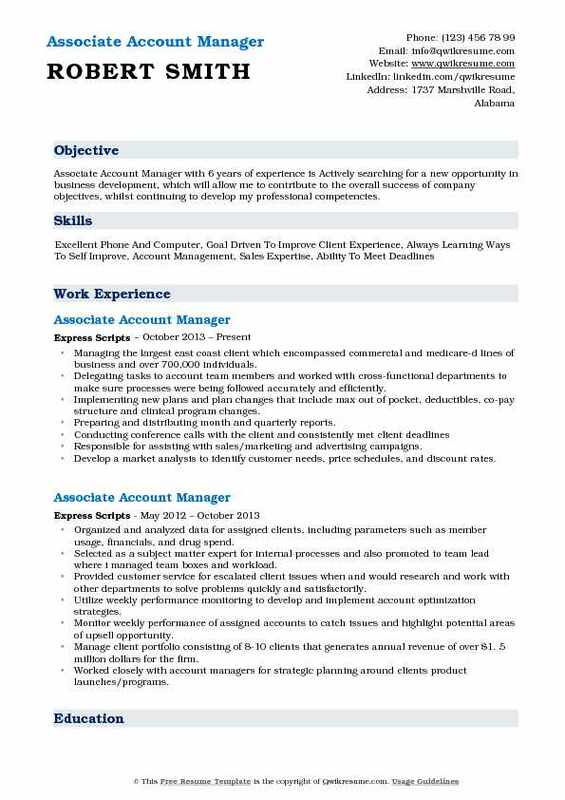 Summary : Account manager with 7 years of experience in the areas of account management and customer service. 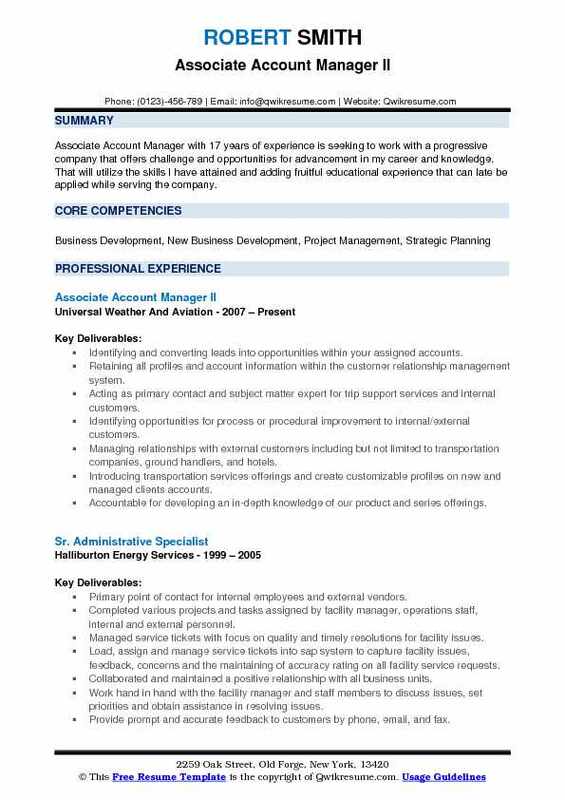 Well organized, self-motivated with proven ability to utilize excellent interpersonal, communication and leadership skills to gain leads. Supported client partners with the production of online video content and incident resolution for businesses around the country using online video advertising strategies. Identified potential new opportunities to improve client education by monitoring current processes. Used prospecting strategies to target key decision makers of new and existing clientele. Provided metrics and analysis to west coast region (Arizona, California, Colorado), specifically key sales. Engage new customers and strengthen relationships through exceptional account management. Form and manage relationships with vendors to ensure optimum return on cost and execution. Drive revenue with existing clients and generate new business opportunities. 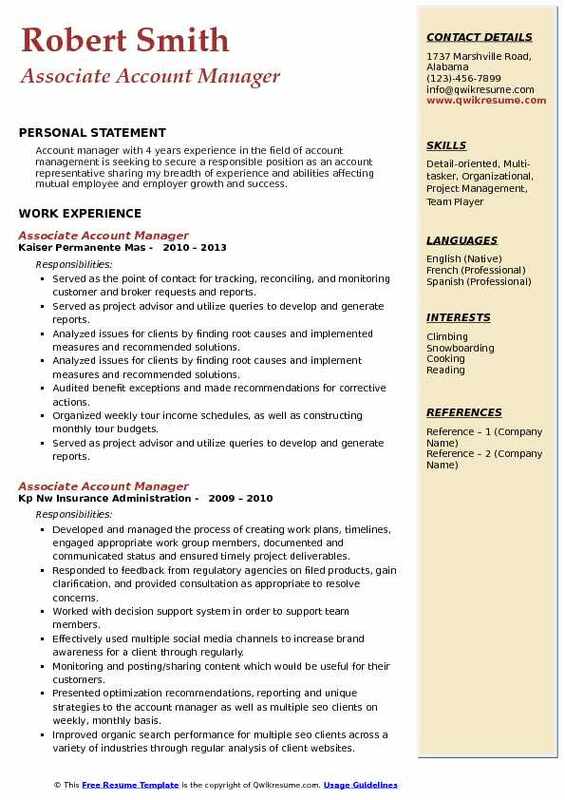 Objective : Account manager with 4 years experience in the field of account management is seeking to secure a responsible position as an account representative sharing my breadth of experience and abilities affecting mutual employee and employer growth and success. Served as the point of contact for tracking, reconciling, and monitoring customer and broker requests and reports. Served as project advisor and utilize queries to develop and generate reports. Analyzed issues for clients by finding root causes and implemented measures and recommended solutions. Analyzed issues for clients by finding root causes and implement measures and recommended solutions. Audited benefit exceptions and made recommendations for corrective actions. Organized weekly tour income schedules, as well as constructing monthly tour budgets. Summary : Account manager with 8 years of experience in the field of account management is seeking to continue my career within a high growth, reputable and strong institution which will value my skills, standards and strong work ethic. Assisting in increasing store business by 128% and e-commerce by 104% in 3 years. Assisting with seasonal and modular product development for better homes and gardens. Managing e-commerce item creation, item management rollbacks to maximize sales online. Consistently met client deadlines and shipped all orders via the most cost-effective method. Maintaining active participation and membership in networking organizations. Managing projects to make sure that they get completed in a timely manner. Developing a market analysis to identify customer needs, price schedules, and discount rates.